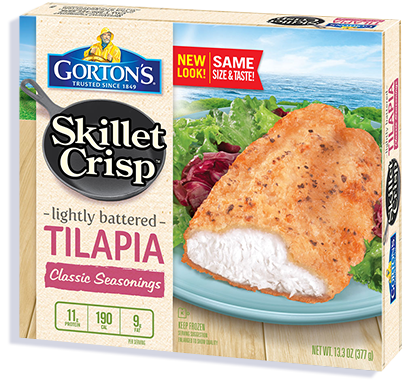 5-Star Tilapia® lightly coated in classic seasoning. To create our Tilapia Classic Seasonings, we carefully select the mildest, flakiest 5-Star Tilapia® fillets, then lightly coat them in savory herbs & spices with just a squeeze of real lemon — packing more delicious in every bite. 1. Heat oven to 425˚F. 2. Arrange frozen fillets in a metal baking pan, leaving space between fillets. 3. Bake uncovered 21 to 23 minutes*, turning fillets over after 12 minutes of cooking. *FULLY COOK FISH TO AN INTERNAL TEMPERATURE OF 145˚F OR HIGHER BEFORE SERVING. 1. Arrange in a non-stick skillet. 2. Cook over medium-low heat 18-25 mins*. 3. Turn fillets over every 5 minutes throughout cooking. Stovetop temperatures vary, adjust times accordingly. INGREDIENTS: Tilapia fillets, batter coating, canola oil. Wheat flour, modified corn starch, water, salt, tapioca dextrin, butter (cream, salt), spices, sugar, nonfat milk, baking powder (baking soda, sodium aluminum phosphate), natural flavor, citric acid, dehydrated lemon peel, maltodextrin, xanthan gum, turmeric extract (color). Not a significant source of vitamin A and iron. 40mg of EPA and DHA Omega-3 fatty acids per serving.